After entering your Username and Password, click “Sign In” to continue. 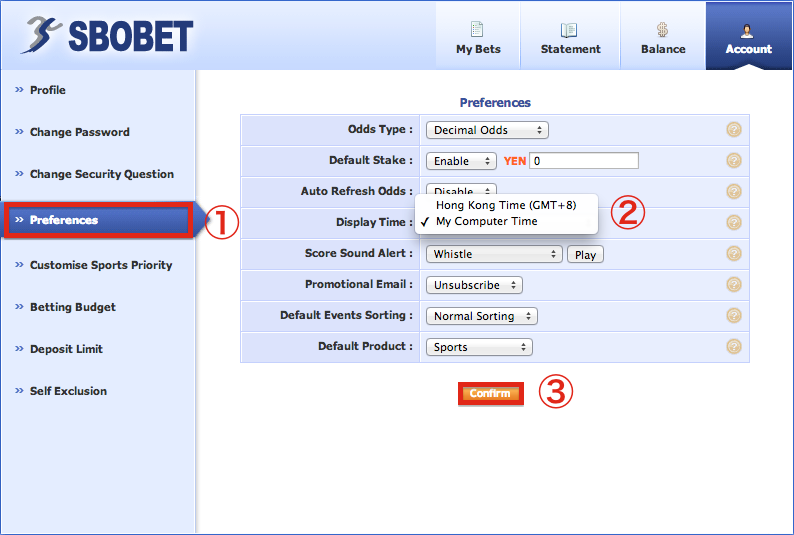 SBOBET offers two different betting menu views (Europe and Asia). For how to place a bet in the Europe menu, please refer to #3-5. For how to place a bet in the Asia menu, please refer to #6-8. 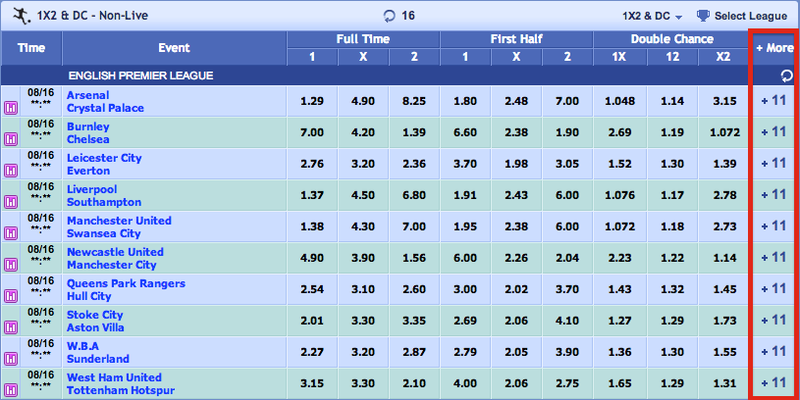 In this example, we will show you how to place a bet on an English Premier League soccer game. First, click on “All Events” located at the top left-hand side of the screen. Scroll down to the Football list of markets and click “Football” followed by “England” and then “ENGLISH PREMIER LEAGUE”. 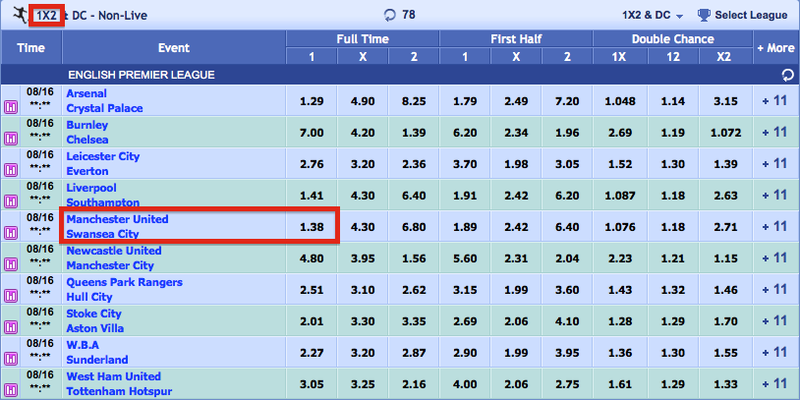 One of the easiest to understand bet types is “1X2 Match Betting” (also known as Money Line or Full Time Result). 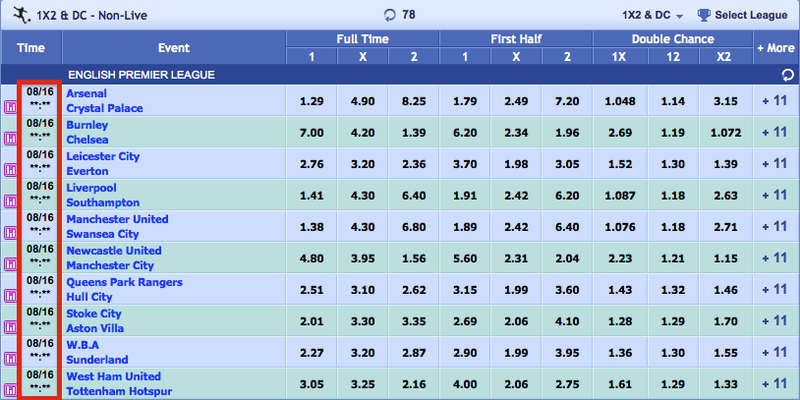 A 1X2 Match Betting bet means you pick which team you think will either win or tie. In our example above, we have three choices by either picking 1 – Home) Manchester United to win, 2 – Away) Swansea City to win or X – Draw) Manchester United to tie Swansea City. In this example, we will pick Manchester United to win, therefore we will click on the odds 1.38. ※ Note the date and time of the match in the left-hand side of the screen. The date and time are displayed based on the current time zone of your IP address. To change your preferred time zone, click on “Account” in the upper left-hand part of the screen followed by the “Preferences” tab. From the “Preferences” tab, you will be able to change your preferred time zone from the Display Time section on the screen. To finalize the change, click the orange “Confirm” button. Once you enter your stake (the amount of money that you would like to bet), the amount of profit that you would win on the bet is shown automatically under the “Est Win” section. Keep in mind that the amount shown in the “Est Win” section is only your profit if the bet you placed is a winning one. If you do win your bet, the profit in the “Est Win” section plus the amount of your stake combined will be returned to you and can be reviewed in the “Est Payout” section on the slip. If you would rather place a bet to win a certain amount of money, enter in the amount of money that you would like to win on a particular bet in the “Est Win” text box. After entering in a figure, refer to the “Est Payout” figure to see the amount of money (stake + profit) that would be returned to you should you win on the bet. 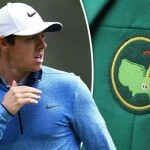 The “Stake” and “Est Payout” figures will be calculated automatically. 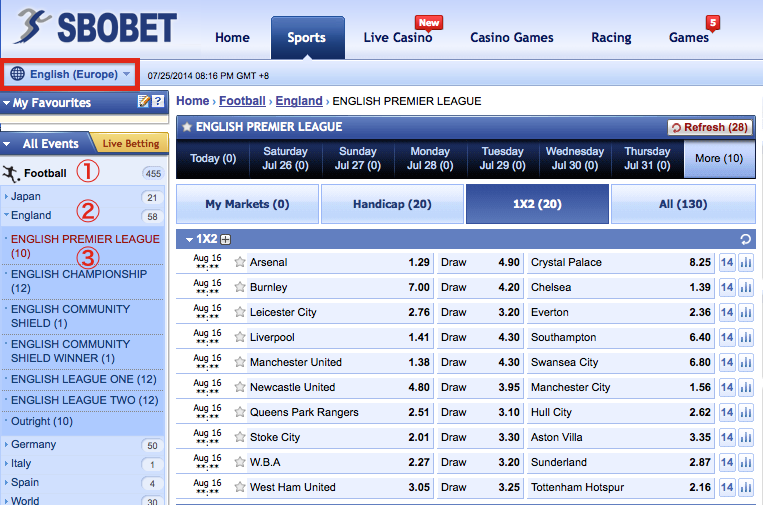 Once you have entered the stake for your bet(s), next click the orange “Place Bet” button to finalize your bet(s). If you refer to the screenshot below, you will see “14” to the right of the game’s odds. 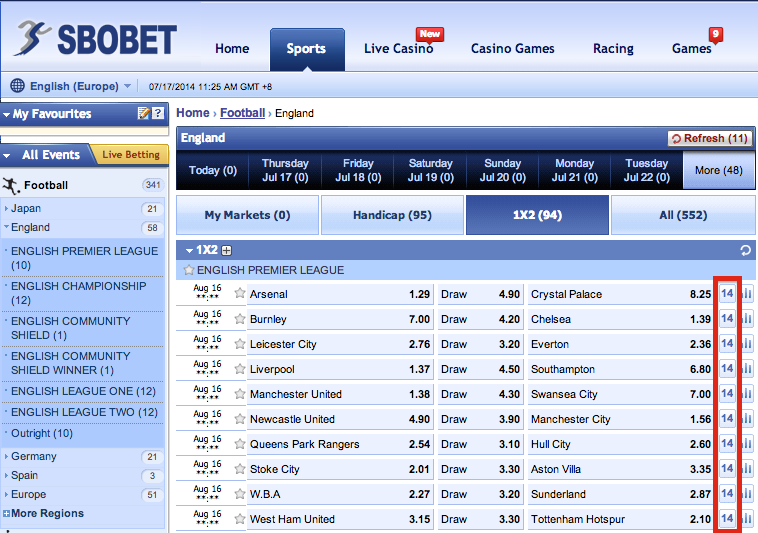 If you click on this tab, all available bet types (14 in this example) will be shown to you for this particular game. A “Half Time Full Time” bet, also known as a “1st Half Result/2nd Half Result” bet, means that you can place a bet on what you think will be the correct outcome of the first half and also the final score. 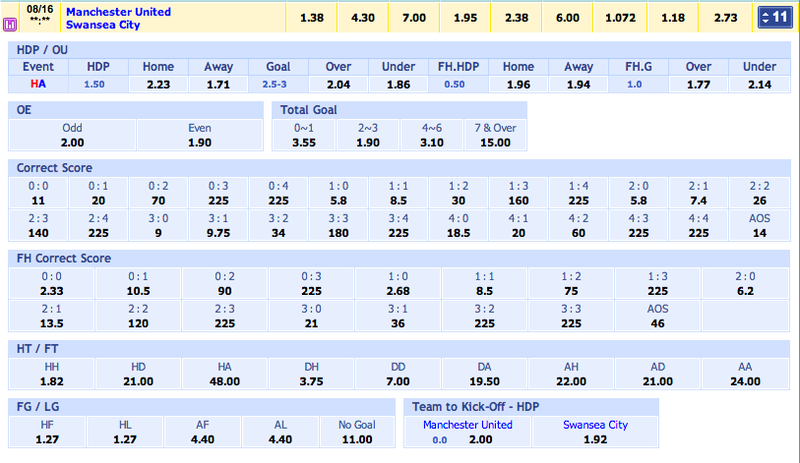 Using the Manchester United – Swansea City example, if the score at half time is 0-1 and the final score is 2-1, you would need to bet on “Away – Home” in order to win the bet. 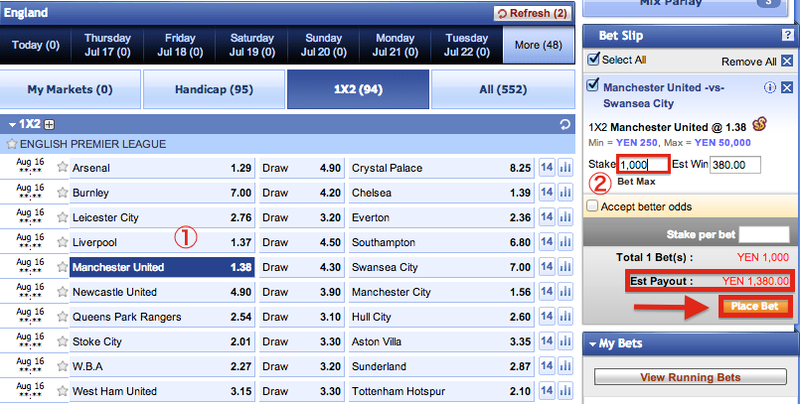 In this example, we will show you how to place a bet on an English Premier League soccer game. 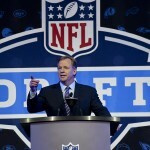 First, click on “Football” from the list of sports on the left-hand side of the screen. 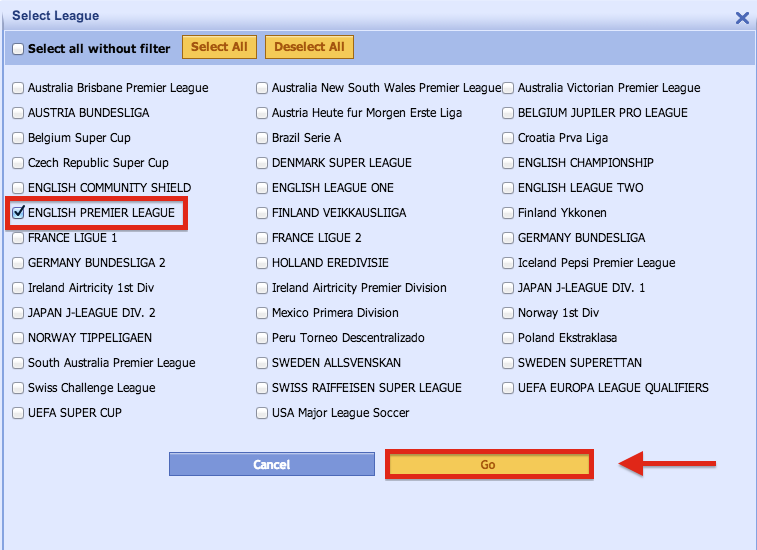 Next click “Select League” followed by inserting a check mark next to ENGLISH PREMIER LEAGUE and then click “Go” as shown in the screen below. From the “Preferences” tab, you will be able to change your preferred time zone from the Display Time section of the screen. To finalize the change, click the blue “Confirm” button. 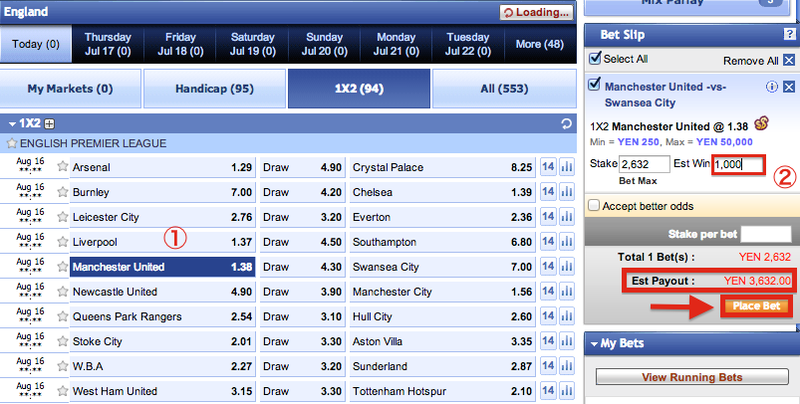 After clicking the odds that you would like to place a bet on, your bet selection will show under “Ticket” located on the left-hand side of the screen. Once you enter your stake (the amount of money that you would like to bet), the amount of money (stake + profit) that would be returned to you should you win on the bet will be shown automatically under “Max Payout”. 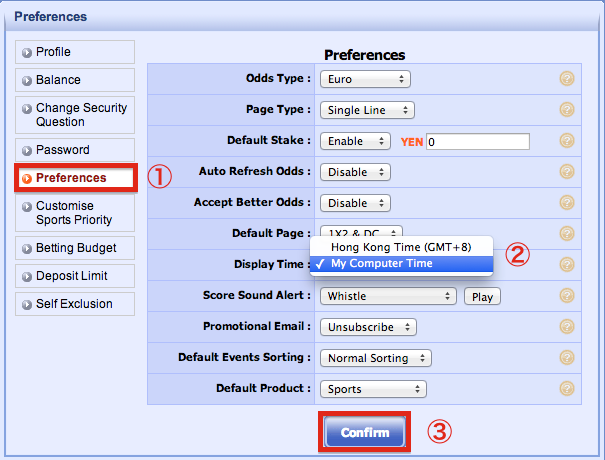 Once you have entered the stake for your bet(s), next click the yellow “Submit” button to finalize your bet(s). If you refer to the screenshot above, you will see “+11” to the right of the game’s odds. If you click on this link, all available bet types (11 in this example) will be shown to you for this particular game as indicated below. 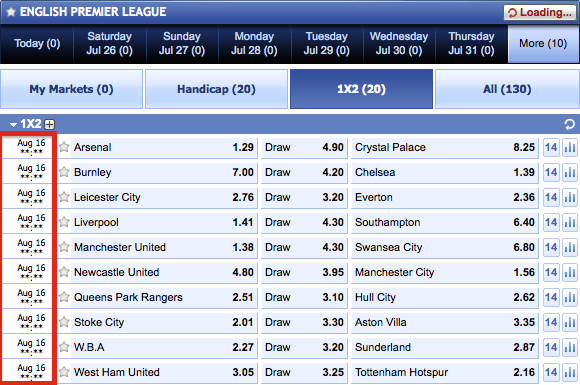 Looking to make a wager at SBOBET? View here for a step-by-step guide. Plus, learn how to register, deposit, and withdraw your money/winnings.